The numbers may be dropping slightly, but the United States remains by far the most coveted destination for international students. And Fairleigh Dickinson University is one of the leading U.S. hosts, ranking consistently in the top 20 when compared with peer institutions by U.S. News & World Report and the International Institute of Educations’Open Doors survey on international admissions trends. 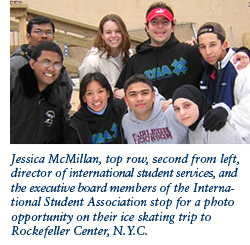 There were 1,068 international students at FDU in the fall 2004 semester. Compared to the year 2000, the number of new international students in 2004 rose 24 percent. One reason is FDU’s location near New York City. The region offers a wealth of resources and entertainment, and the diversity of cultures and communities in the New York metropolitan area provides a comfort zone for a student traveling from afar. In fact, the locality hosts more foreign students than any other metropolitan area in the United States. “We’ve had an aggressive recruitment plan for the last four years, and we’re now at the point were it’s like a snowball,” says Shea, who joined FDU in 2000 and is now in his 27th year in international admissions. Shea’s position combines both graduate and international admissions, which is appropriate since approximately 80 percent of FDU’s international students are in graduate programs. 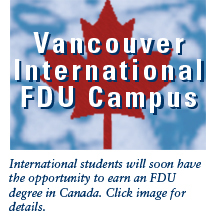 Many of FDU’s programs are very appealing to the international market. For example, the one-year MBA in management with a concentration in global business administration features an intensive full-time curriculum focused on global issues with small classes, a mix of domestic and international students, and workshops and networking with global professionals. Shea says two primary things drive a student’s choice of educational destinations: affordability and institutional reputation. To make FDU more affordable, the University is among the few that provide financial aid to these students. 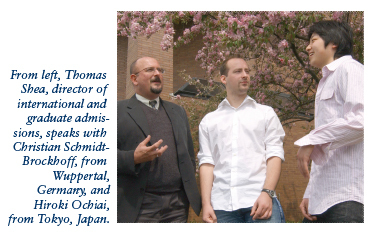 In addition to international student scholarships, in 2004, the Col. Fairleigh S. Dickinson Scholarship program included international student applicants, who typically come to the University as the top scholars from their areas. FDU’s strong academic reputation further fuels interest. “Our hospitality, computer, business and engineering programs in particular have strong reputations for excellence,” Shea notes. And, the University’s large international population is seen as a confirmation of value by many abroad. FDU is particularly attractive to students from certain areas. Currently, more than 50 percent of FDU international students hail from the Indian subcontinent (which includes India, Nepal, Sri Lanka and Bangladesh). The University has long been active in India, and the country has many students looking to study abroad. Shea is hoping to expand the University’s recruiting emphasis to several other areas of the globe, particularly Korea, Thailand and Cyprus, where, he says, FDU has large alumni populations who can help recruitment efforts. These relationships extend beyond convincing prospective students to apply to the University. The international recruiters maintain contact with new students through the visa process as well. New visa regulations, established after the tragedy of September 11, 2001, have proven particularly challenging. For example, in addition to undergoing rigorous security checks, each visa candidate must meet in person with a member of the U.S. Embassy or Consulate. This process entails a nonrefundable application fee, often a wait of several weeks or even months for the interview appointment, travel to a potentially far away office and long waits on line for the interview, which can last from three minutes to an hour. Recently back from a recruiting trip to China, Shea acknowledges that, for the first time in more than two dozen years of recruiting, he has found himself competing with recruiters from other English-speaking countries such as Australia and the United Kingdom. If students arrive with hesitations, the Office of International Student Services (ISS) can assist in many ways, including counseling on immigration issues. As the first office of the University to which students are introduced when they arrive, ISS runs orientations twice a year for the University’s international students, most of whom have seen nothing of the University beyond its Web pages. “Most of our incoming students have never been to the United States and have no idea what to expect when they get here,” says Jessica McMillan, director of international student services. Anyone who has ever left the security of one’s own childhood home to live on a college campus can relate to the feeling of awe and newness that dominates the freshman year, particularly in the first semester. Imagine that feeling coupled with being in a foreign land. Language barriers, culture shock and misperceptions by their American peers can be quite daunting to international freshmen. Food is always an issue when traveling to or living in a foreign land. In the last few years, Gourmet Dining, Inc., the University’s campus food vendor, has done a major overhaul of its traditional meal offerings. Particularly on the Metropolitan Campus, where the dining hall has been dubbed the “World’s Fare,” selections reflecting the many cultures of FDU have been made available, including a wide variety of vegetarian selections for the large population of students from India. Because many international students come from the top of their classes, they are generally very successful academically, with 40 percent of them participating in the University Honors Program. But it’s not all academic. These students get involved — and Fairleigh Dickinson offers a wealth of opportunities. From the International Student Association (ISA), with chapters on both FDU campuses, to the Indian Cultural Exchange (ICE), opportunities abound for cultural interaction. The University has Asian, Japanese, Chinese, African, Caribbean, Haitian, Islamic, Italian American and Latin American cultural clubs. But it’s not only cultural clubs these students enjoy. They participate in University athletics, fraternity and sorority life, drama clubs, chorus, campus radio stations and newspapers as well as academically oriented clubs such as the student chapter of IEEE (Institute of Electrical and Electronics Engineers) and the Philosophy Club. Several international students serve in leadership positions, including an international student representative to the Student Government Association. Most international students seek employment on campus. Some need the work to support their educational costs. Others enjoy the satisfaction of generating their own cash flow for the first time in their lives, rather than depending on their parents for spending money. From gaining work experience in the United States to seeking full immigration status, to going home to start their careers, the options are numerous. Eventually FDU’s international students must prepare for life after graduation. From gaining work experience in the United States to seeking full immigration status, to going home to start their careers, the options are numerous. Staying in the U.S. is appealing for many graduates, especially those whose fields of study are not well represented at home. It may be an attractive option, but the process required to get a U.S. work visa can be daunting. Another possibility for international graduates who wish to work in the states is application for Optional Practical Training, a one-year period of employment after each level of study (bachelor’s/master’s/etc.) for practical work experience that would not be available in the graduate’s homeland. Others choose to return home to start or continue their careers. Many of those who return home have as their main reason for coming to FDU the perceived value of an American education in furthering their careers in their home countries. Some are even obligated to return to their homelands to work because their education was financed by their employer. Whatever they decide, having studied away from their native lands leaves international students with many gateways of opportunity throughout the world. ©Copyright 2005 Fairleigh Dickinson University. All rights reserved.